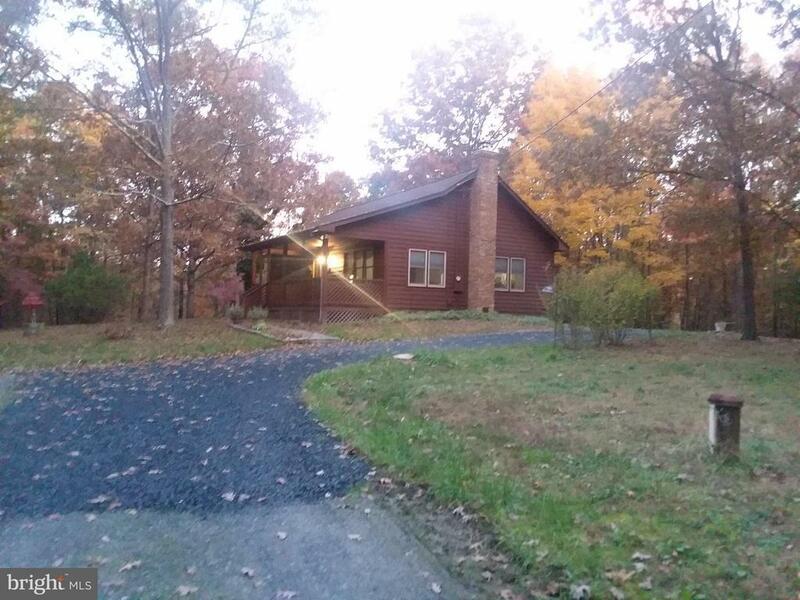 Come home to this Private Oasis and Charming Custom Built Rough Cut Cedar Siding Home in the Woods! One Owner & in Excellent Condition! 2 Main Level Bedrooms, 2 Full Baths with possible 3rd bedroom OR use as Den OR Home Office in loft area. Open Concept Living w/Newly Refinished Hardwood flooring on main level - $3, 000 & Brand New Plush Carpeting in Bedrooms - $3, 000, stairs and Upper Loft. Cathedral Ceilings w/Beams and plenty of natural light. 2 Story Family Room w/Super Nice Wood Burning Stove and Brick Floor Surround. Included a Linen Closet, Coat Closet and Hot Water Closet and Laundry Closet in Kitchen. Newer Kitchen Tops & Flooring - $3, 000. Enjoy your Relaxing Front Porch after a Hard Day at Work, just bring your Swing and youre in Heaven! Custom Built Carport & Storage Shed w/New Gravel on Driveway in 2018 by house w/ample parking. New Roof in June of 2016. New fixtures & light in Main Level Bathroom. New Quartz Counter Tops in 2017, New Pleated Blinds w/Light Darkening in Bedrooms. New Washing Machine in 2018, Custom Painting in 2017. Exterior of Home was Power Washed & Stained in Fall of 2017, Chimney cleaned in Fall of 2018. New 20 Gallon Well Pressure Tank in Fall of 2018. Minutes to all Major Shopping, the Shenandoah River, Skyline Drive, Dinosaur Land, Luray Caverns & a driveable to visit Washington DC & Much More! Can Settle Quickly! This is a trustee sale and will be Vacant soon. Directions: RT. 66 WEST TO EXIT 6 FOR US-340/US522 TOWARDS FRONT ROYAL/WINCHESTER. TURN LEFT ON RT 637 - RELIANCE RD, RIGHT ON RT 637 - CAUTHORN MILL, FOLLOW TO GRAVEL DRIVEWAY ON LEFT, 1419. SIGN IN YARD ON LEFT. Inclusions: CAST IRON WOOD STOVE CONVEYS.